Recent research indicates the organism Wolbachia may adversely affect the standard method of heartworm treatment for dogs. Many veterinarians will suggest a course of antibiotics prior to beginning traditional treatment protocol to eliminate it. The current research indicates the Wolbachia organism may be directly responsible for many of the complications associated with the therapy and elimination of worms. Research indicates Wolbachia and adult heartworms have a symbiotic relationship and the survival of the adult worms depends on this particular organism. These organisms live in the adults and are present during the entire life cycle of worms. They remain inside the heartworm until it dies; at which time, they are released into the bloodstream and tissues of the infected dog. 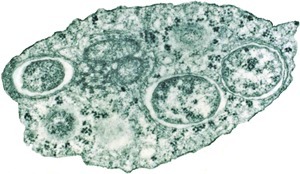 The massive quantity of Wolbachia that are released in the tissues and bloodstream can cause severe inflammation particularly in the endothelium of the pulmonary artery (the endothelium is the thin layer of cells that lines the blood vessels and the pulmonary artery is the main blood vessel carrying blood to the lungs to get enriched with oxygen – see Wikipedia for more information. Many dogs will suffer a severe allergic reaction to the amount of Wolbachia that are released into the bloodstream. In more severe cases the organism can cause kidney disease and inflammation in the lungs. A slightly ‘off-beat’ look at Wolbachia! Research also indicates prescribing antibiotics to kill Wolbachia may in fact adversely affect the heartworm’s survival and may reduce possible allergic reactions in dogs once the worms are killed. Your dog is actually protected from the Wolbachia organism as long as the worms are alive. Most veterinarians now require the use of antibiotics prior to beginning treatment in an infected dog. Antibiotics are not a standard protocol for heartworm treatment; however, in light of new research most veterinarians are adopting the antibiotic protocol. Treating a dog infected with adult heartworms is a painful process for your dog. In addition, the treatment itself can pose a significant health risk for your dog. Eliminating the Wolbachia with antibiotics can minimize your dog’s reaction to the heartworm therapy. Treating an infected dog is costly and usually takes two months to complete. Administering antibiotics to eliminate Wolbachia first, may extend the length of the treatment and increase the cost. However, the cost of the antibiotics is not significant and most veterinarians include the cost in the heartworm treatment plan. I am scared to death My 40 pound basset has been on prednisone 5 mil every other day for a month, he is getting ready for his heart worm treatment on April the 2nd. From what I am reading this is not good. He is a rescue baby and had the worm when I got him .